The launch of the ASEAN Economic Community is finally upon us. At the end of next year, 15 of South East Asia’s most prominent economies will band together as key trading partners in a move unprecedented in the region. This, of course, will open many doors for industrial development, and there is no exception for the insurance industry. Viriyah Insurance is already a market behemoth in its native Thailand, and, with the launch of the AEC, it is poised to take the next step into the wider world of the pan-Asian insurance market. Pravit Suksantisuwan, Deputy Managing Director at Viriyah Insurance PCL, spoke to us about the challenges and opportunities this burgeoning market will offer insurance companies across the region. What are the biggest opportunities in the Thai non-life insurance market? The upcoming launch of the ASEAN Economic Community in the region opens up more significant opportunities for the Thai non-life insurance industry. Insurance companies will benefit from the opening of markets in many countries, especially those that have competences and readiness. The overall population of AEC countries is currently around 600 million people, which makes it the third largest population in Asia, after China and India, and a whopping nine percent of the global population. It is one of the world’s large economic groups, with 2.4 percent of the world’s GDP. These offer many positive factors for non-life insurance companies in the region. The leading countries in the region are Singapore, Malaysia, and Thailand. 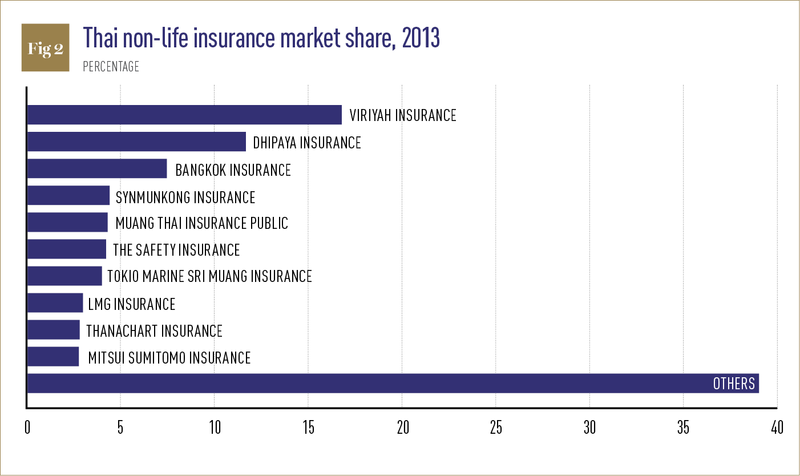 In 2013, the non-life insurance industry in Thailand gained about THB200bn (around $6.25bn, see Fig. 1). It is expected to grow much more after the opening of the AEC in 2015. 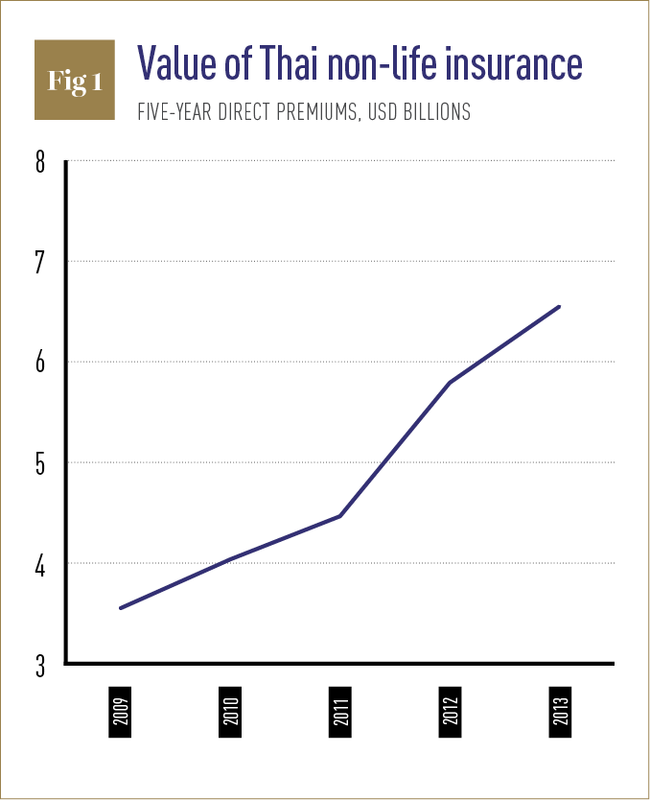 In 2013, comparing among insurance companies in ASEAN in terms of premium size, Singapore, with its 37 insurance companies, gained premiums worth about TBH300bn. Thailand, with its 65 insurance companies (see Fig. 2), gained about TBH160bn. Indonesia, with 84 insurance companies, gained TBH150bn. Geographically, Thailand is located in the middle of the ASEAN countries, which is a major advantage in terms of transportation. Have the auto and industrial markets suffered this year, as was predicted? As a consequence of the government’s tax refund for purchasing cars in the year 2013, the total number of cars sold for the first two quarters of 2014 has declined as much as 40 percent when compared to the year before. The business forecast indicates the total number of cars sold will have a total decline rate of 30 percent for a one year period. Thailand’s economy is returning to normal after a prolonged political incident during the first half of the year. Thus, without unexpected natural disasters, economic and political crisis, the premiums of the motor insurance business will likely return to normal growth. What are the key trends facing the market? Developing quality of service in underwriting and claims to gain more efficiency and effectiveness in order to serve all customer needs in a timely fashion is definitely a major factor most insurance businesses care about. This can also be used as a strategic business policy to gain more customers and ensure high satisfaction. Since customers are looking for high returns on their investment, they will absolutely renew or buy more insurance policies. Furthermore, they will talk to their friends or family members about the good experiences they have. Insurance renewal rate is another key area where insurance businesses have been competing. Due to the decreasing rate of newly registered vehicles in the market because of negative economic factors, the political situation in Thailand and the high level of purchasing in the previous year – due to a benefit from the government – the sales of all passenger vehicles have dropped compared with last year’s sales. This definitely leads to declining revenue of insurance businesses, especially for those who focus on auto insurance. All insurance companies certainly need to retain all existing customers as best as they can. Moreover, all insurance businesses will need to prepare for the coming AEC in 2015. This has been a hot issue and insurance businesses of all sizes have been working on their business assessment and development: training and providing more skills for their employees, developing more competitive products and expanding their network to serve their customers in all areas. 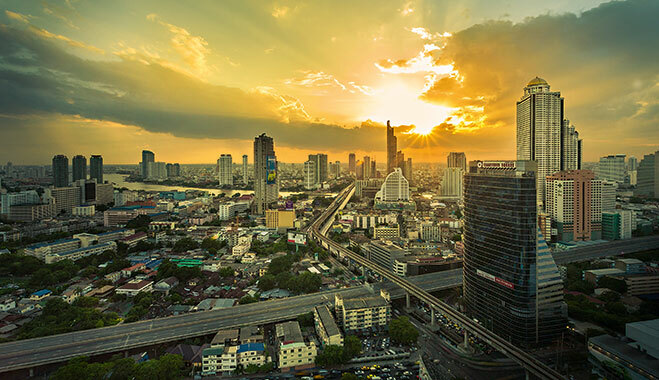 As the economy continues to grow and develop, the new government continues to lay down well-defined goals, and AEC opportunities: the insurance business in Thailand is expected to steadily expand for the next three years. However, should any adverse situations arise – such as disasters or uncertain political situations – there could be more challenges for insurance businesses in the Thai market. Why should foreign investors be looking at these opportunities? Because the penetration rate of non-life insurance in Thailand is still low, it has a very high potential for growth. After the great flood in Thailand in 2012, the consumer interest in buying insurance has increased exponentially due to knowledge and a better understanding of the gains from having insurance coverage for their property. The government also continuously promotes and supports insurance businesses and a variety of insurance policies. These projects include microinsurance (which focuses mainly on low-wage consumers), the Insurance Bureau System (which acts as an insurance-related information centre to help insurance-related businesses improve their efficiencies). E-Claim offers an internet gateway and online payment system. There’s been a transformation of buying and selling insurance coverage from conventional methods to doing it online. Purchasing motor compulsory insurance policy online is an example for that. Furthermore, lots of reports are in real-time, to efficiently improve information systems and serve people in Thai communities more effectively. Foreign investors are able to support and stimulate the growth of non-life insurance by providing useful information, new innovations, new technologies and new management systems. Experiences, such as how to systematically analyse and manage various risks, and new innovations in compensation managements and claims, will help strengthen the stable growth of Thai non-life insurance industry. How are your products different to those of your competitors? Currently, both life insurance and non-life insurance products are limited within the tariff system regulated by the Office of Insurance Commission. As a result, the company is unable to improve, create or provide a wider range of coverage for consumers, but instead focuses mainly on after-sale services (compensation services). By focusing mainly on customer service, Viriyah Insurance has been well known for a long period of time. We are the best non-life insurance company in the country. We have the most efficient compensation service system, which covers 77 provinces around the country. We offer many services such as accident inspection services and repair centres. What plans does Viriyah have to expand into new regions? We see a lot of opportunities and beneficial gains from the ASEAN Economic Community. As a result, we have formed a partnership with insurance companies from countries participating in the AEC community, in the form of Co Sign. We have partnered with Allianz General Laos – the largest insurance company in Laos – to expand our Carrier’s Liability Insurance and insurance coverage for cross-border commercial vehicles between Thailand and Laos. The coverage will be expanded to cover the customers of people and businesses in the AEC mainland (including Malaysia, Singapore, Vietnam, and China) in the near future. Currently, we are negotiating with major insurance companies in Malaysia to conduct co-insurance of life insurance and non-life insurance in the Malaysian market. We believe that, by being the best, the largest, best-known and highly trusted insurance company in Thailand – combined with exceptional expertise in companies’ stability and compensation service systems – Viriyah Insurance will have a better chance of gaining many advantages and opportunities from the ASEAN Economic Community. Fortunately, Thailand is geographically beneficial when compared to other countries in the AEC. As a result, Thailand will act as a logistics hub for imports and exports in the East-West Economic Corridor. We have planned insurance policies for in-land transportation that would cover most personal and commercial vehicles that need to travel throughout Myanmar, Laos, Malaysia, Singapore, Vietnam and China. The company is developing products to support Thailand’s role as a logistic hub for the AEC. For instance, there are travel insurance, accident insurance, and health insurance products.